The gentlemen of Sigma Chi Fraternity would like to thank everyone who came out to support their Broomball event. It was lots of fun. The Ladies of Lambda Theta Alpha Sorority are still tabling and opportunity drawing tickets this week to win a $25 gas card and other prizes. This week, the lovely ladies of Kappa Delta Sorority will be having their “I fell for a KD” event on Wednesday, Nov. 2 in the SMSU Student Union from 6p.m. to 9p.m. 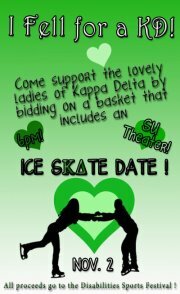 Gentlemen will be able to bid on a date with one of the ladies of Kappa Delta and then will go on an ice skating date with whom they bid on. all proceeds from this event will be donated to the Disabilities Sports Festival. So come have some fun and bid on your favorite Kappa Delta. National Book Drive: Come by our table and bring any children’s book that you would like to donate. Nominee Obstacle Course: come and see your favorite nominee as he passes through a variety of challenges to become one step closer to the title of our SMOOTH SILVER KING!! Join them in celebrating the crowning of their SMOOTH SILVER KING! !